Just as a disclaimer – I have been so busy with Easter egg hunts, friends in town, a CPR class to study for, and life in general that I haven’t been able to post on the blog for ten days. I have written the one for last weekend but haven’t been able to get the pictures up. So, here is what went on this past week…. Sidney Shelton Youngs is a great friend of mine. Her parents and my parents are best friends. They currently live in Asheville, but are getting ready to move to Charlotte. Yeah! Her husband, Bobby, has been staying with us three nights a week while he is working at his new job here in Charlotte. His family, however, is still living in Charlotte. This past week, Sidney and the kids came down for three nights to hang out and be together. It was great! Sidney and the kids arrived Tuesday afternoon and within minutes, all five kids were playing together downstairs. Sidney said, “I don’t think I will have to do much childcare this week”. She was right. 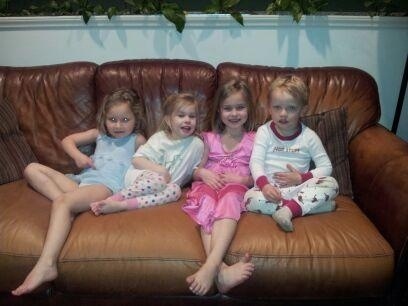 Five kids are easier than two….at least when there are two moms there. 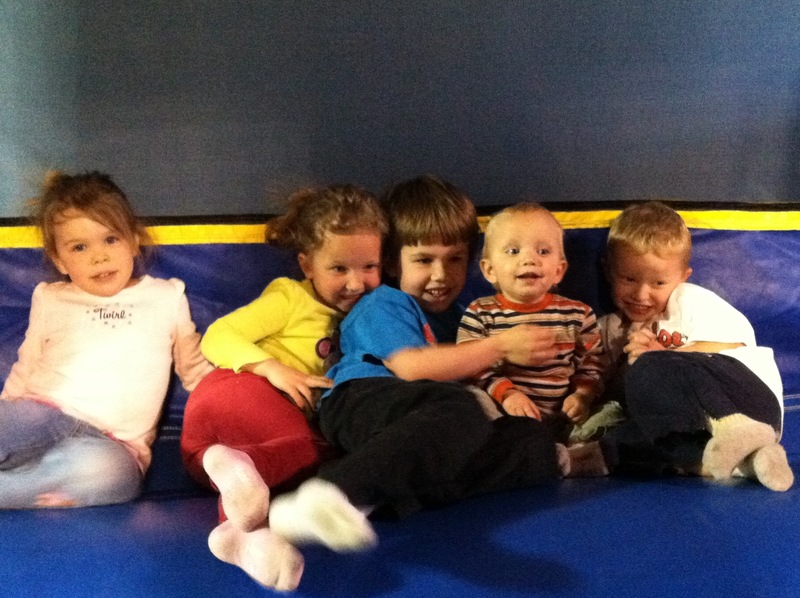 Wednesday morning we went to Space Kidets, a bounce house place that I had a Groupon for. I had never been there before, and it was great. Smaller than Monkey Joe’s and hardly any kids. Almost all of the games in the game room were free as well. Totally worth the time and money. I will probably go back. On Wednesday night we actually found a babysitter that was willing to watch all five kids so that we could all go out with Doug and Jacqueline. It was fun to all go out together. We had dinner at a brewery, tried to bar hop, but ended up sitting around and having a drink at the bowling alley (which is actually a hip place to hang out these days). At dinner, the question was asked, “How old do you feel?”. My initial response was, “28” because I feel like I am mentally still in my late 20s. Later on that night, we entered a very casual bar on our route. At that moment I realized that I didn’t like dive bars anymore and preferred nicer places. Then it struck me…I AM a 40 year old! I am no where near the 28 year old that loved dive bars and drinking cheap beer….yuck! I would take an expensive martini in a pretty restaurant over a dive bar any day. I can also tell that I am 40 when I wake up tired the next morning, and slightly hung over, after having only three drinks. Older and wiser, right? 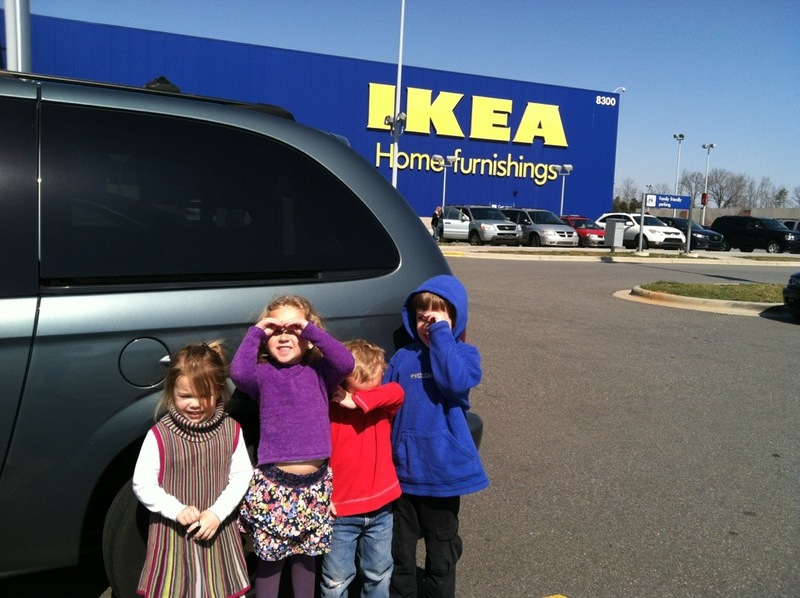 On Thursday morning (despite our tiredness), Sidney and I decided to brave taking the five kids to Ikea. They have an amazing, free, one hour play zone for kids. Although there is no way you can get out of that huge store in one hour. We tried anyway. Miller was too young so he came with us. We went through the show room and then finally found the room with all of the actual stuff that you can buy. We took more time then allowed, but I came home with a great set of curtains. Probably a good thing that we didn’t have more time. I would have spent more money than needed. On Friday the Youngs left and went on their way to Winston Salem. We had a great time together. the kids got along great, played well together, and Sidney and I were able to do half the work than we usually do during the week. A very successful visit. This entry was posted in Uncategorized and tagged ikea, sidney, youngs on March 28, 2013 by Becca. When I first had kids I read in all the baby books about the option of having, and sleeping in, a “family bed”. I thought that there was no way that I would intentionally sleep in the same bed as my kids. I thought that was only something that hippies did. Well, five years later it seems that we now have a family bed. Unofficially, we have had one for years, but now I am finally admitting it. Faith starting crawling in bed with us when she was three and still does it a couple of times a week. Now, Wilson has started climbing into bed with us. He sneaks in at some point, curls up next to me, and falls asleep. I used to take him back to his bed, but now I let him stay. We are three nights into this new routine, and it is working for us. …by “us” I mean me and Wilson. Over the past few months Wilson has been very whiny and quite hard to handle. I have been at my whits end with him. I have been frustrated and impatient with his whininess. However, the past three days he has been a different child. He has been happy and agreeable. No whining. No pretending that his legs don’t work so that I would carry him. No crying about what drink I gave him. He is saying “please”. He is a new kid. Is he happier because he is getting his “Mommy time” at night? Is his “love bucket” being filled during the night so that I don’t have to fill it as much during the day? I don’t know, but if so, I will sleep with him every night in order to have a more pleasant day. I have literally had such a great few days that I don’t want to jinx changing anything. Luckily, Faith has spent the last three nights on the floor in Miller’s room. She wants to sleep with her baby brother. She wants to be “like a Mommy” and sleep with the baby like I did when Miller was first born. I love it! She goes to bed quickly and earlier than she has. She can’t come out of his room and stall going to bed. She also doesn’t get out of bed in the middle of the night and come get into bed with us. She sleeps all night on the floor in Miller’s room. She is so sweet to him, always. Couldn’t have better timing either, now that Wilson has taken her spot in our bed. For now, Wilson will be sleeping with me. Will his sunny disposition continue? That remains yet to be seen. If it doesn’t continue, he will be back in his bed next week. For now, I will be cuddling up with the snuggliest three year old I know. This entry was posted in Uncategorized and tagged bed, wilson on March 21, 2013 by Becca. Here in Charlotte, there are at least six major kid consignment sales during the month of March. Most of these take place at a church or YMCA. It is a great way for moms to get rid of unnecessary baby items and clothing while making some money at the same time. Baby products are crazy expensive are most of them are things that you use for a limited amount of time. Consignments sales are a brilliant idea. I can sell all the things cluttering up my house and I get to keep 70% of my revenues. Sometimes I go to the half price sale on Saturday afternoon, if there is something specific that I am looking for. 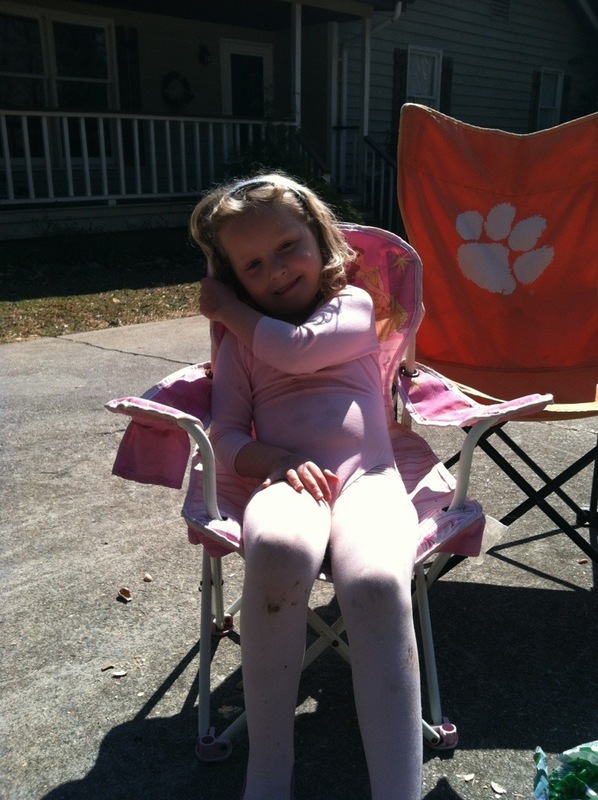 Faith likes to go so she can buy a cheap toy or dress….which I usually let her do. This year, I will be consigning my things at the sale down the street at Sardis Presbyterian. Yesterday I dropped off 152 items to be sold tonight and tomorrow. I priced everything to sell and hope it all does. If it doesn’t sell then I will be donating the rest of the items. Last year I earned $125 and I hope to earn more this year. This entry was posted in Uncategorized on March 15, 2013 by Becca. 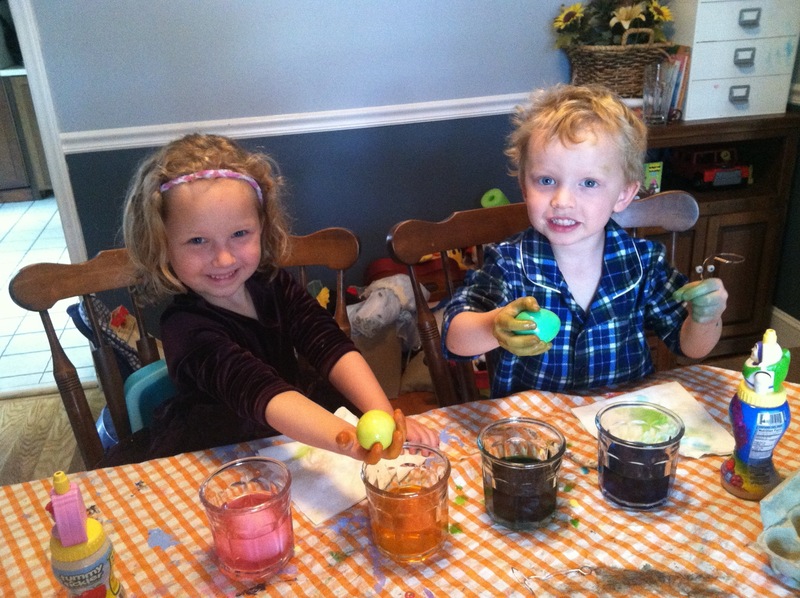 For the kids, one of the best parts about Easter is dying Easter Eggs. I typically buy 3-5 boxes of the dye kits so that we can use them all year long. 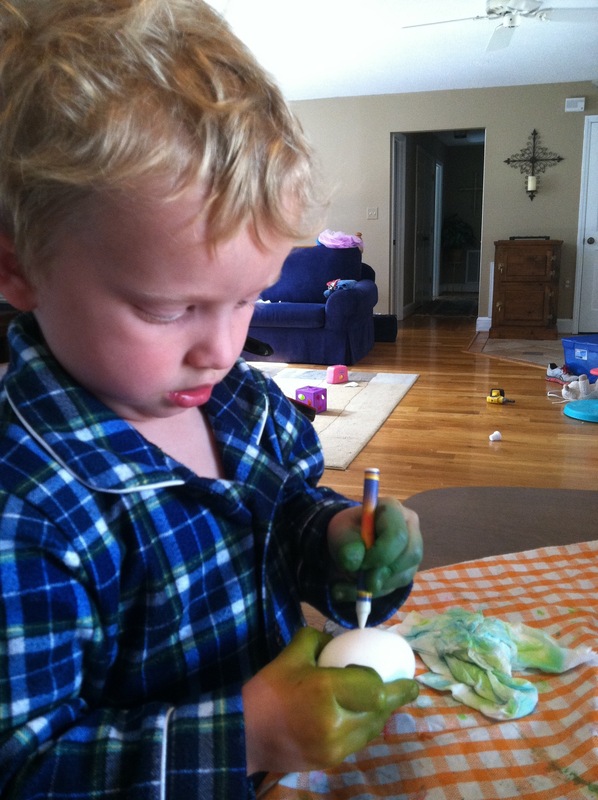 They rarely eat the hard boiled eggs, but love to color them. Most of the eggs end up being either brown or green in color because the kids dip the same egg in all of the colors: blue, green, pink, yellow….turning the eggs brown. This year the green dye must have been the most potent because they are almost all green. The kids start by using the little egg holder, but in the end just use their hands to dunk the eggs and pick them back up. Wilson’s hands were as green as the eggs. I kept telling him that he looked like he had Incredible Hulk hands because they were so green. 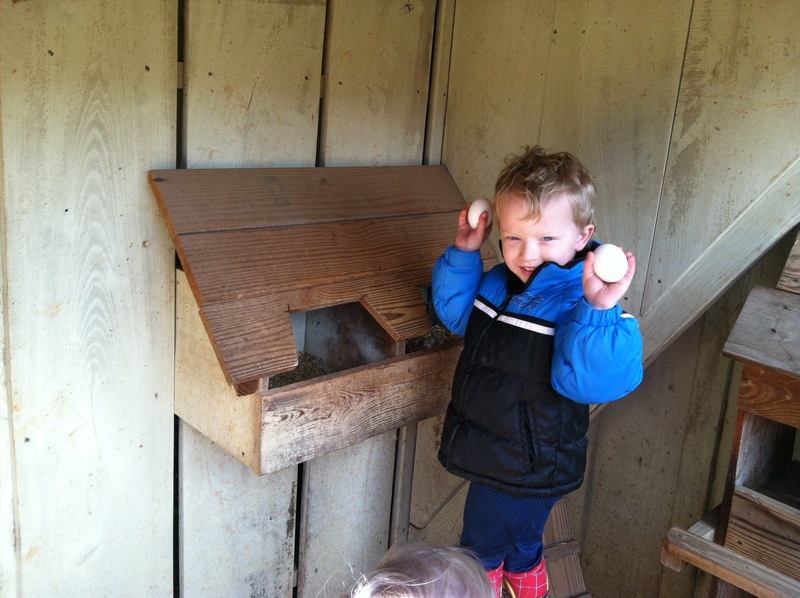 This entry was posted in Uncategorized and tagged Easter, Eggs on March 12, 2013 by Becca. The weather in Charlotte has been beautiful this past week. This entry was posted in Uncategorized on March 11, 2013 by Becca. Miller is really growing up. He wants to do everything that the older kids do. He no longer wants to sit in his high chair. He only wants to sit in the booster that he sees the big kids sit in. Today he wanted to ride on the front of the stroller while holding on to the tray, like he sees the older two doing. He sits on the couch like a big kid, stands up on a stool like a big kid, uses a tv tray in the floor, and even wants to ride the tricycle fast like a big kid. He is growing up in other ways as well. 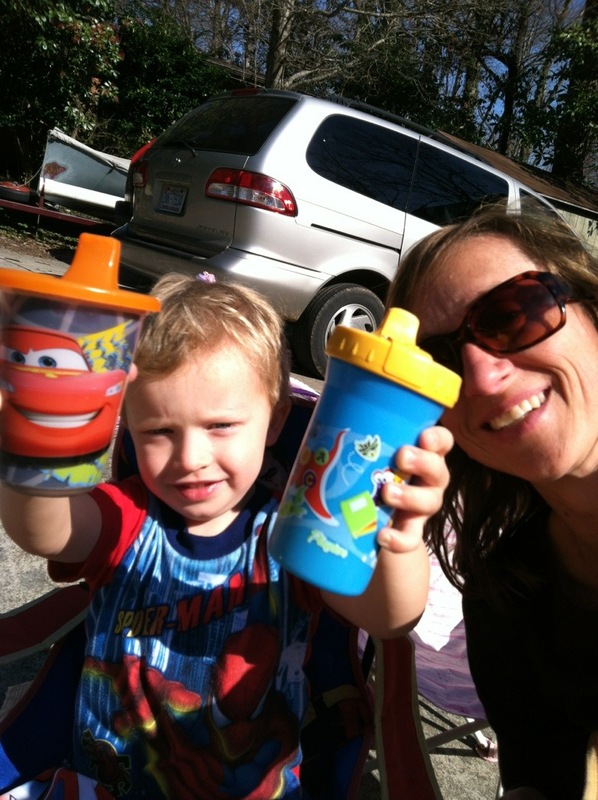 In February he got both of his lower molars and another lower front tooth. He can say: yea, bowl, ball, eat, Daddy, uh-oh, hi, Mamma, more, eye, bock-bock like a chicken, and bark like a dog. He can stick out his tongue when asked, “where is your tongue?” and will point to your eye and say, “eye”. I am truly amazed at his vocabulary and his ability to communicate. He loves to laugh and play with Faith and Wilson. He will go into the guest room with them, close the door and play whatever they are playing. He carries a golf club around at mom’s house just like everyone else. 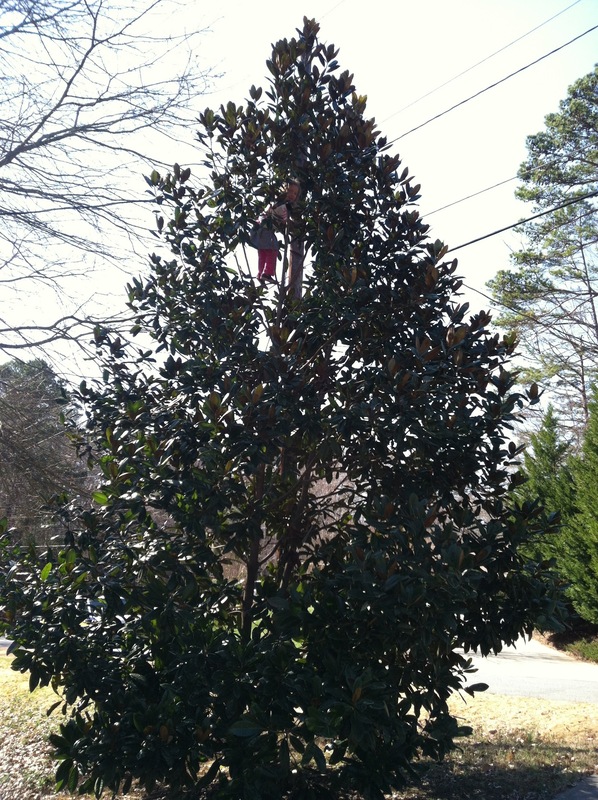 My dad calls him a “spider monkey”. This is because he clings on to us like a baby monkey. He wraps his legs around our waist and holds on. My little monkey! 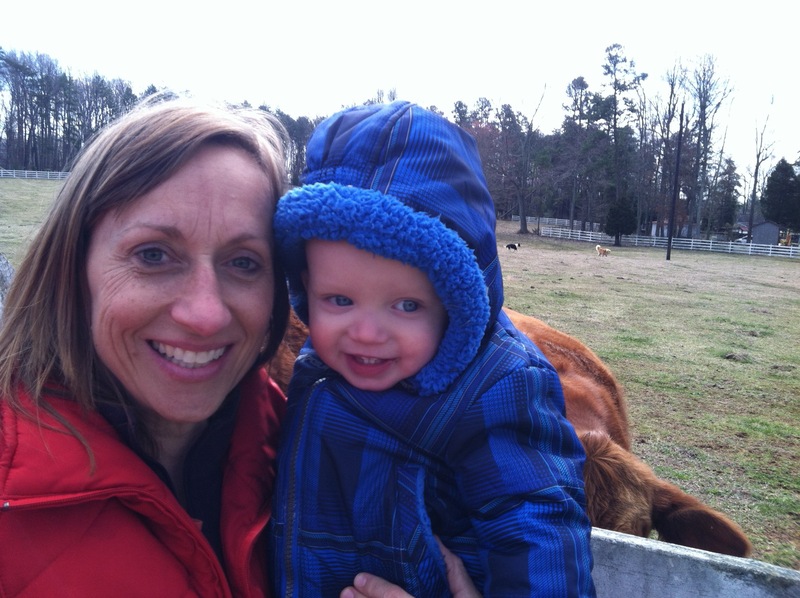 He is still small, loves to be held, and loves even more to be breastfed. I thought that would have ended when I went to Colorado for five days. I was only nursing him once or twice a day before I left so I assumed that he wouldn’t really care about if when I came back. Wrong! He pants like a dog when he wants to nurse (it is his own sign language). I guess he got my milk supply back up after my trip because he wants it more than ever. Tom says, “Who wouldn’t!”. Although my baby is growing up, his is still my baby. I think I cherish this stage of his life so much more because he is my last baby. No more! God told me that we were going to have three kids, but not four. Tom took care of birth control for us this past fall. It feels very strange to know that we won’t have any more kids. Every other January or February I get pregnant, which would be right now, but not this time. 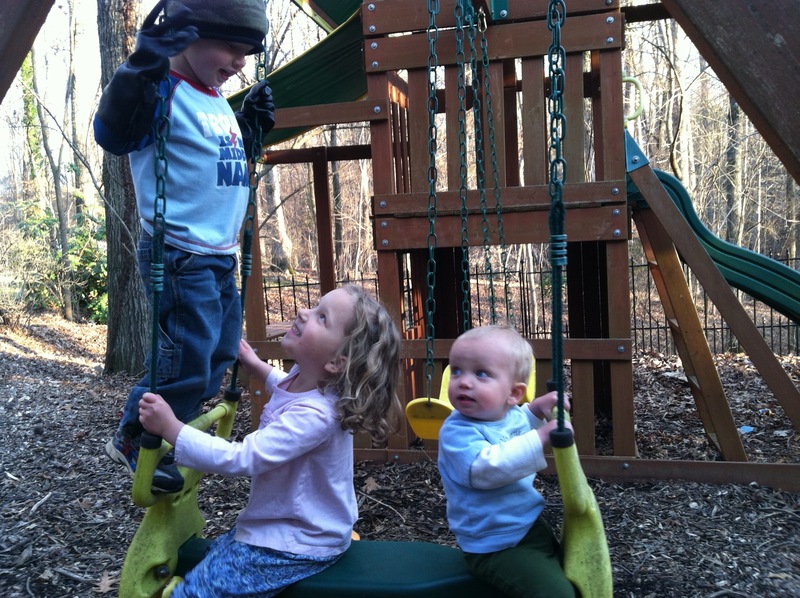 It is time to enjoy the three children we have and begin new experiences with them. There are so many more “firsts” to come as they grow up. It will be exciting to see what is next! 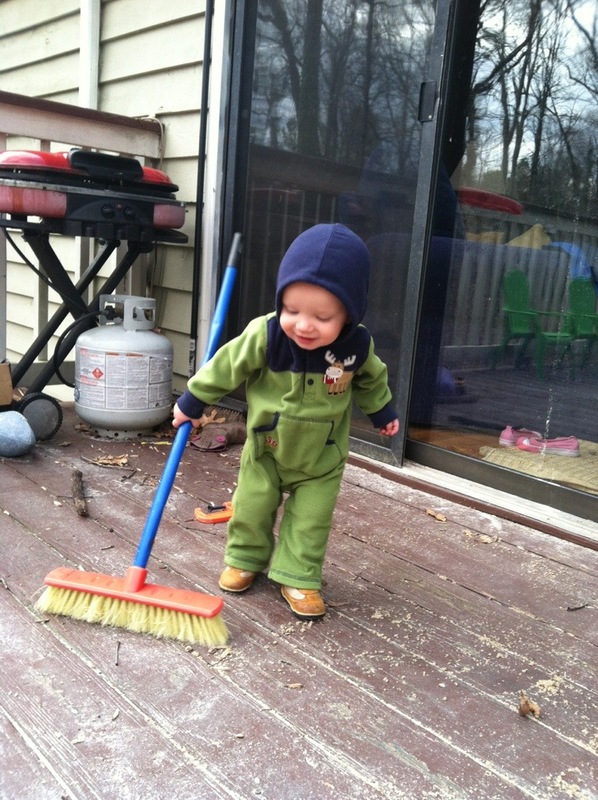 Here is Miller sweeping the porch for me…like a big kid! 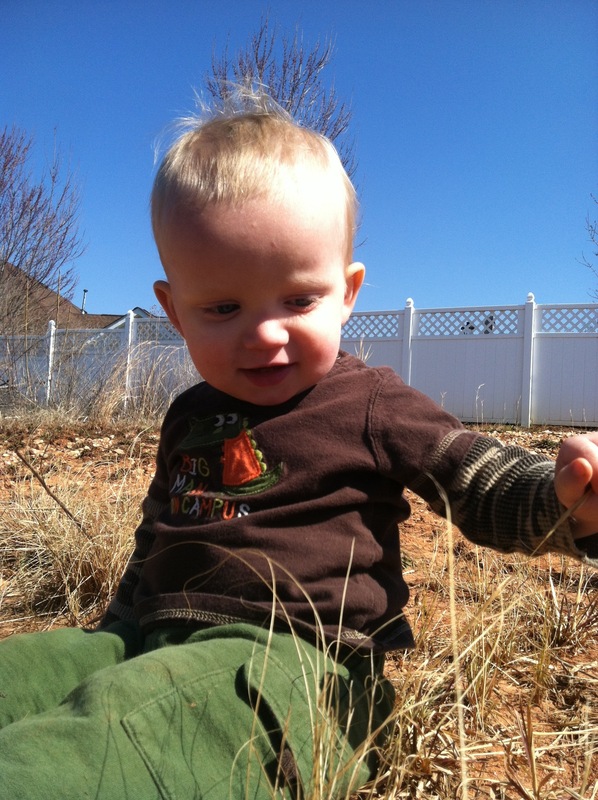 This entry was posted in Uncategorized and tagged baby, Miller on March 8, 2013 by Becca. After we left Grandma’s place we headed south about thirty minutes to my Uncle Alan and Aunt Betty’s house….better known as “The Compound”. We call it “The Compound” because they live on many, may acres with Betty’s parents, two brothers, and their son, Merritt’s, family. I love it there! I keep telling my parents that I want to live on a compound with them and Lisa’s family. It is so beautiful there (I should have taken better pictures of it). There are four houses, two lakes, cows, chickens, a goat, resident ducks, dogs, golf carts, tractors, a swimming pool…. and the list goes on. It is just so peaceful there. I love my Uncle Alan. He has always been my favorite uncle. I go to him for advice on just about everything. He is the one that baptized me ten years ago and kept hounding me to change my life for the better. He is great! It just so happens that his youngest son, Merritt, got married just before I did, and has three kids about the same ages as mine. His wife, Kendra, and I have become good friends and our kids love to see each other! Every time we visit them we are treated like kings! Alan cooks an amazing meal for us, gives me a glass of wine (even though they never drink), and just makes us feel welcome and at home. I love it there! I have to say that the most amazing thing I saw all weekend was six-year-old Anna driving the golf cart from Alan’s house to her own house (about a 1/4 of a mile) to get their bikes. She drove it all alone and did an amazing job! I just stared and laughed. That is farm life, I guess. 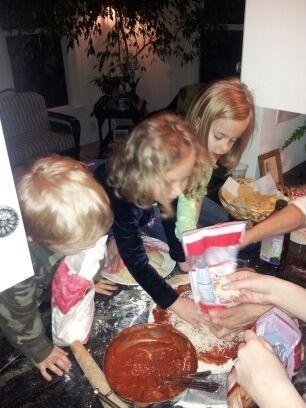 Last night the kids helped Alan and Betty make the pizza. 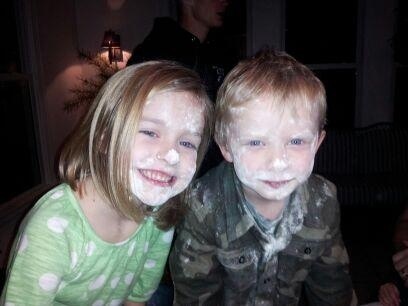 Anna taught Wilson how to put the flour on his face….a “must do!” when baking! I am so blessed to have such an amazing extended family. I know that I can go see people who love me, love my kids, take care of us, and encourage me in my walk as a mother and a child of God. This entry was posted in Uncategorized on March 4, 2013 by Becca.